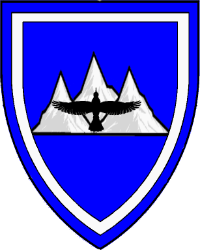 Azure, on a mountain of three peaks couped argent a crow volant to chief sable, an orle argent. Name registered with the College of Arms in May 2010. Device registered with the College of Arms in March 2011. Device image courtesy of Etienne Le Mons d'Anjou, 2/2015.